David Pothier, Consultant Otologist at Toronto General Hospital and a previous TWJ Fellow there, has died at the age of forty-four. 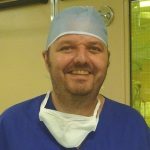 He was a remarkably energetic, larger than life character with a passion for endoscopic ear surgery and a great enthusiasm for teaching it. He ran an innovative multi-disciplinary dizziness clinic, and had a prodigious research output. He will be sadly missed. A celebration of his life took place on Wednesday 1st August 2018 at Toronto General Hospital and is available as a webcast here. The Trustees are extremely grateful to the Frocester Trust for a most generous bequest in memory of Charles Wickham-Jones (see below). The entire assets of the Frocester Trust have been transferred and this will enable the TWJ Foundation to considerably expand its activities. In recognition and appreciation of this the TWJ Short Fellowships have been re-named “CWJ Short Fellowships”. Charles Wickham-Jones, who was a founder and passionate supporter of the TWJ Foundation, has died in Oxford at the age of eighty-nine. In 1974, working with Patrick Jobson and David Wright, he helped to launch the Foundation which was established by his aunt Mrs Lilian Higgs in memory of her father Thomas Wickham-Jones, a London wharfinger. 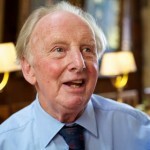 For nearly forty years, Charles Wickham-Jones was an active Trustee taking a prominent role in the Foundation’s activities. A strong supporter of the NHS, he greatly enjoyed interviewing candidates for its Fellowships. Even in recent years, when ill health prevented him getting to meetings, he followed the work of the Foundation with considerable and sustained interest. The Trustees are extremely grateful to the Jobson Foundation for a generous bequest which has enabled the TWJ Foundation to significantly expand its activities. The Trustees of the TWJ Foundation are pleased to be working in partnership with the Trustees of the Graham Fraser Foundation in order to coordinate their efforts in respectively offering Fellowships in otology-neurotology and in cochlear implantation. Please visit the Graham Fraser Foundation website.